Anita – A Must See Documentary Out Today! In 1991, Anita Hill was called before a Senate hearing to publicly testify about her allegations of sexual harassment by her former boss Clarence Thomas, who was then under review for nomination to the Supreme Court. Hill’s testimony ignited a firestorm of controversy, and propelled the issue of sexual harassment in the workplace into the forefront of national discussion. 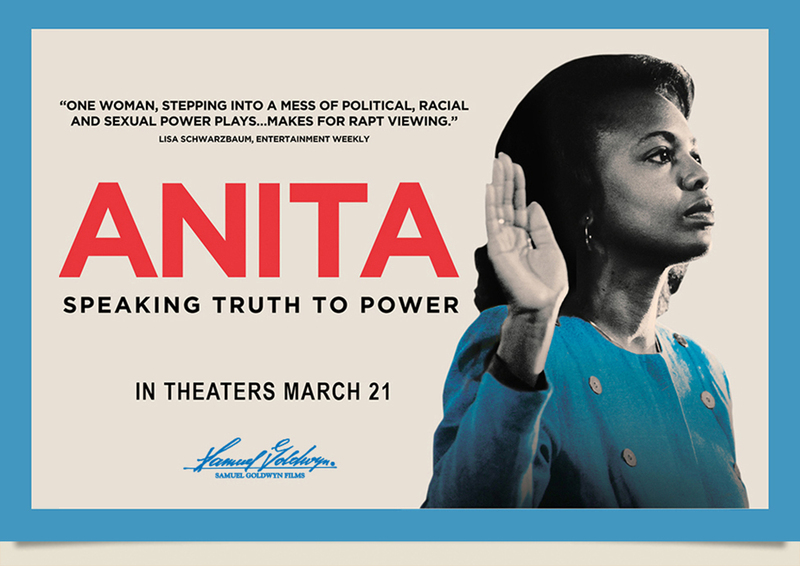 Over 20 years later, Hill is finally telling her story on film in the new documentary, Anita, which opens in theaters today. I was privileged to see the premiere of Anita when it debuted at the 2013 Sundance Film Festival over a year ago, and now that Anita is finally getting a theatrical release, I hope this film will be viewed far and wide, both to educate a new generation, and to remind the older ones about how our world was changed by Anita Hill. What is most fascinating about Hill’s story is that she never sought attention or aspired to be a national public figure or feminist icon. Her testimony was the result of a leak to the media of a private interview she gave to the FBI in confidence; an interview that was requested of her as part of the background checks into Clarence Thomas during his nomination process. When the content of her interview was leaked to the press, Hill was called to testify before a committee of white male Senators about a subject that until then was rarely talked about, let alone on national television. Despite the indignity of the proceedings, Anita Hill sat before this committee and calmly and astutely answered their questions about Thomas’ behavior towards her while working for him at the Department of Education and the Equal Employment Opportunity Commission. While Thomas was eventually confirmed to the Senate in a 52-48 vote, the fallout from Hill’s testimony was much more widespread. While criticism was lobbied at her from every angle, eventually forcing her to resign from her teaching position at the University of Oklahoma College of Law five years after the hearings, the issue of sexual harassment was given a national forum for discussion and debate, prompting many changes in attitudes and policies. During Anita‘s premiere at Sundance, Hill was present for the Q&A after the screening, and her grace and composure in person exemplified the way in which she told her story in the film. Always well-spoken and passionate, Hill spoke of how the hearings impacted her life, and why it is important that her story be told. I’m thrilled that Anita will now have a chance to reach a wider audience, because her story is important, and her dignity and composure in the face of the overwhelming character attacks that have continued throughout the past two decades is something to be celebrated. Whether they know Hill’s story or not, women in the workplace today owe a lot to the courage of Anita Hill; in fact, we all do. *Please note I am a financial supporter of this film through IMPACT Partners, a social impact film investment group through which I have had the honor and privilege of investing in many social impact films. I could not be more proud to be affiliated with this one in some small way. Next Post Happy 80th Birthday Gloria Steinem!